The Chapman Learning Commons, located on Level 3 of the Irving K. Barber Learning Centre on the UBC Vancouver campus, includes two workshop spaces, the Dodson (302) and Lillooet (301) Rooms. The Dodson and Lillooet Rooms are available for booking by UBC faculty, staff and students. Room booking fees may apply. 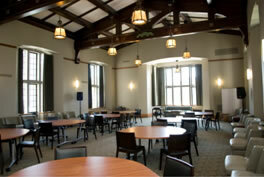 Events and activities in the Dodson and Lillooet Room should contribute to lifelong learning and student academic success by enhancing information technology skills, learning skills, wellness and by promoting unique, open learning opportunities. Events must be public, open to all students and have campus wide impact. Please note that we are unable to host closed events, meetings, classes, fundraisers, concerts/recitals, receptions or events that are commercial in nature events, charge a registration fee (beyond cost recovery for catering), or involve the solicitation of funds. Through the workshop space provided in the Chapman Learning Commons, we strive for an environment that fosters dialogue and discussion and that supports student learning. The Chapman Learning Commons management team reserves the right to make decisions around what events are deemed appropriate for our space. Find something you don't recognize? Please refer to the definitions of our AV terminology on this page. 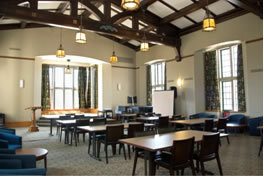 AV services and room rental fees may apply in both rooms. Interested in booking the Dodson or Lillooet Room? Library Staff - Please contact your department's point person who will have access to the Lillooet and Dodson Outlook Calendar. Bookings can be made via this individual. UBC Faculty & Staff - Submit your request through our online booking form. Please note that we are only able to accommodate workshops & events that contribute to learning/academic success and that are open to all students and the UBC Community (i.e. no closed events). For inquiries, please contact ikblc.bookings@ubc.ca. This page was last edited on 4 November 2011, at 00:36.